Jen-Ken has close relationships with the manufacturers of a variety of digital controllers, such as those from SDS Industries and Orton. This means you will have nothing but the best the best in terms of performance and accuracy in your firings. With a selection of multiple controllers available - you can choose exactly what fits your needs. The top of the line. The bread and butter. The cream of the crop. The controller for those who want to make their lives easier, improve their craft, and make incredible quality products. This is our top selling controller - And for good reason! The TAP Smart Controller is without a doubt the best choice on the market right now - It's easy to use, has stellar performance, and is packed full with features! It has more memory than any other controller, allowing you to more easily utilize, revise, and save many different kinds of firing programs. Storage for firing programs is virtually unlimited! Create as many profiles, with as many steps as you'd like - you won't be limited by this controller. Our favorite part though: When ordered with the Wi-Fi Dongle, you can control everything from any device! Prefer to work on your computer or tablet - how about your phone? With an internet connection to your TAP Smart Controller, updates from SDS Industries can be applied to your controller automatically - ensuring you always have the most up-to-date software for years to come! Easily adjust the in-progress firing, skip steps, and view all graphical information on your firing with just a "TAP"! The amount of time you save by working with the TAP Smart Controller pays for itself for years to come - you'll be so happy with this investment that you won't know how you managed so long without it. The TAP Smart Controller supports the Loud Alarm option. 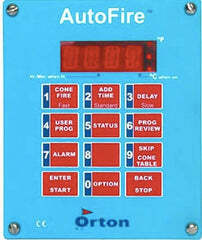 The Orton AutoFire 3000 12-Key (AF/AFG) controller has 12 keys for programming. The Orton AF 12-key supports up to 4 custom firing programs. Orton controllers use P-I-D control algorithms to tightly control kiln temperature. This eliminates temperature cycling. Cycling occurs when the controller turns the kiln on or off in a way where the actual temperature does not closely follow the desired firing schedule. Orton controllers store all of the program information in memory when shut off. This is helpful for if power is lost in the middle of a firing, the controller remembers how far the program has progressed and determines if it can resume once power has been restored. The AutoFire controller can add hold time to firings already in progress, edit programs in progress, and even skip in progress! These are some of the most useful features that are offered in both the TAP and AF 12-key controllers. With all ceramic and glass kilns, we highly recommend that they be vented to the outside. But why? First and foremost - is your safety! When heating various materials in your kiln, many have byproducts that burn off and are released into the air. These byproducts are toxic and you don’t want that mixing with the air you’re breathing. The Orton Vent Master has a patented process called “Downdraft Venting”. By manufacturing the kiln with a hole in the bottom, we’re able to attach the vent here and pull the fumes out and vent them outside through a duct or window. This process helps improve the air flow and produce more uniform temperatures throughout the chamber, ensuring that each of your pieces is accurately being heated. The additional oxygen will ensure your colors develop to their truest nature. In addition, with downdraft venting - you’ll extend the life of the elements and other metals within our kiln, ensuring your kiln lasts longer and you have reduced repair costs down the road. We often hear from customers that they are confident that by utilizing their venting system their kiln will last much longer than it would have otherwise and that the investment has more than paid for itself. Model AF Oval 31" 3"
Inside Dimensions 24" x 40" x 27"